London: Oil prices could rally to $100 a barrel next year, a level not seen since 2014, as supply risks in Venezuela and Iran strain global markets, according to Bank of America Corp.
Brent futures, trading near $77 on Thursday, are set to reach $90 in the second quarter of 2019 as world inventories shrink, the bank said. 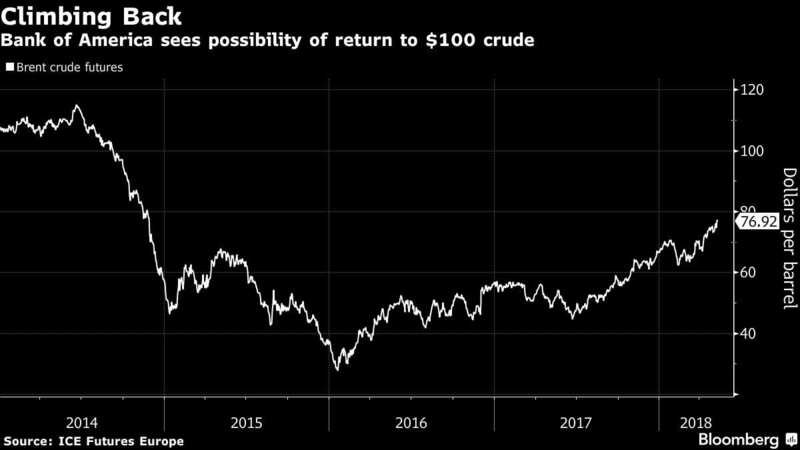 As that view hinges on Opec (Organization of the Petroleum Exporting Countries) reviving output and a limited impact on Iran from US sanctions, prices could go even higher, it said, becoming the first Wall Street bank to suggest a return to $100. Crude has climbed to a three-year high as President Donald Trump’s decision to re-impose sanctions on Iran threatens to tighten a market already depleted by strong demand, Opec production cuts and unplanned supply losses in troubled producer Venezuela. “Looking into the next 18 months, we expect global oil supply and demand balances to tighten," Francisco Blanch, head of commodities research at Bank of America Merrill Lynch in New York, said in a report. While other Wall Street banks have bullish outlooks on crude, theirs aren’t quite as strong as that of Bank of America. Goldman Sachs Group Inc. predicts that Brent will rise to $82.50 a barrel in the coming months, and says there’s a chance prices could surpass that level, but sees oil subsiding again in 2019.